Are you always trying to find ways to make plain rice more appetizing? Well, your search has ended. In this recipe, fresh spinach, herbs, and Parmesan cheese add fabulous flavor and give it some much-needed color. The rice dish is a snap to fix and bake, and it's sure to be a hit with your family. The rice includes a combination of two or three fresh herbs. Choose what you have on hand. Dill, basil, chives, thyme, oregano, and parsley are all very good choices. You can make it with brown rice as well, but add an extra 3/4 cup of stock and increase the initial baking time by about 10 to 15 minutes. The recipe is versatile as well. For garlic flavor, feel free to mince 1 or 2 cloves of garlic and saute it along with the chopped onions. For a vegetarian dish, cook the rice with vegetable broth instead of chicken stock. Alternatively, if you want a heartier one-dish meal, add 1 to 2 cups of diced ham, turkey, or chicken to the dish. Grease a 3-quart baking dish or casserole. Heat the olive oil in a medium saucepan or saute pan over medium heat. Add the finely chopped onion and cook until it is softened and translucent, stirring frequently. Add 4 1/2 cups of chicken stock and continue cooking until the stock comes to a simmer. Put the rice in a colander or mesh strainer and rinse with cold water. Transfer the rice to the prepared baking dish or casserole; add the chicken stock and onion mixture and stir the mixture gently until blended. Bake the rice, uncovered, in the preheated oven for 25 minutes, or until the liquid is almost absorbed. Stir the rice occasionally and add more stock, if necessary. De-stem and chop the herbs finely. Remove the casserole from the oven and stir in the pepper, spinach, herbs, and Parmesan cheese. Taste the rice and add salt, if necessary. If the mixture seems dry, add more chicken stock. Cover the baking dish tightly with foil and return it to the oven. 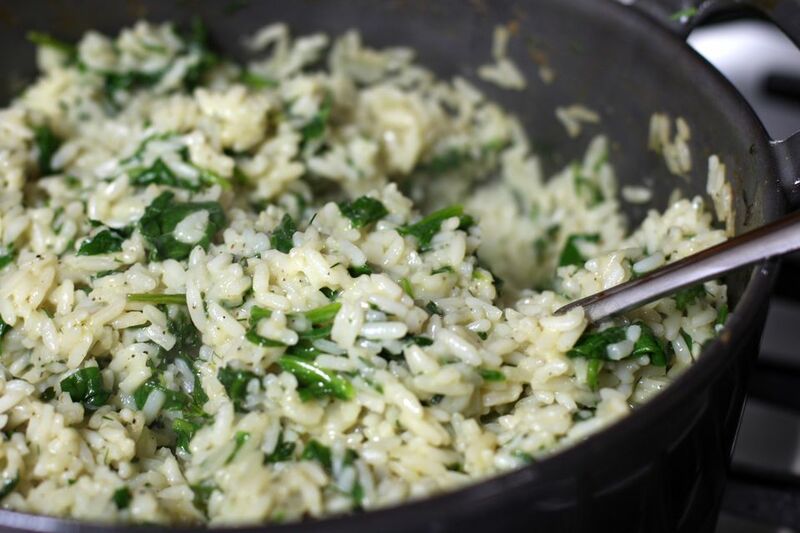 Bake the casserole for about 5 minutes longer, or until the rice is tender and the spinach has wilted. Stir the rice mixture with a fork to fluff.